Hang in, this is a long one…..with some juicy bits sprinkled throughout. Reflecting back on my time in Peru, I have come to some very important conclusions about my time there. As I watch the events continue to unfold in Life, and watch how my personal actions supporting the Stargates of the Planet have created a ripple effect in the Matrix. As I was boarding the plane from Jamaica, the morning of February 25, 2017, on my way to Peru for my 3 week excursion through the annals of time and space within the realms of the Peruvian mountains, I received a text from my sister, letting me know that my father had passed. I almost collapsed on the floor, standing in line, waiting to board the plane. I wasnt sure how to react, to be angry or sad, to be relieved that he was finally gone, and no longer suffering, nonetheless, it came as a shock. I was not expecting this news, as I had only recently found out that he was in chemo treatment for his 5th bout of cancer. I hadn’t spoken to my father in 6 years, we were on good terms and at peace, but for my protection and for peace, I chose to release him and live my life, finally, after 42 years of having him as a handler in my reality, conscious or unconscious on his part. The beauty of the situation revealed itself when the plane waited for me to take off, so that I could text my sister, and complete my conversation with her. Amazing. The Divine Mother revealed herself that day. She gave everyone the opportunity to see a graceful handling of news of this magnitude. I held myself with grace that day, regardless of how I was feeling. Granted, I was probably in total shock. When I received the news, I knew that this was a really good thing, that he had finally let go. He had waited 3 days past my birthday to transition, as I had found out he was really suffering, on my birthday. I told him he better not die on my birthday! I was NOT happy with him. Every experience of my father in the last 48 years has been predominantly negative. I didnt really have much to hold onto in terms of a positive memoir of experiences to remember him by. My father was a lovely man, to others. To me, he was suppressive, consdescending, verbally abusive, and generally not very nice. Even though he loved me, it was difficult for me to really feel the depths of this love, due to the negative aspects of our tumultuous relationship. At one point, I decided to let him go in 2005, and my life began to soar beyond measure. Letting go of him was the best thing I ever did, until he entered my life again, in 2007, and I was crippled by his involvement in my reality. Within a month of him re-entering my life, I lost my job, my house, my relationship, and was again cripled by the weight of the energy, and struggling to survive, and get my basic needs met. The contrast was so incredibly obvious that I knew beyond the shadow of a doubt, that I was being influenced by this energy. It took me until 2011, to again release him and let go, knowing it was what I had to do to heal from the shattered reality of my childhood that had presented itself. The next day, after he passed, after I arrived in Peru, I could not find his Spirit. It was nowhere to be found. I called my friend Erin and we proceeded to search into existence to find his soul and release him from entrapment. We found him in a black box, with no light, he had no idea where he was and was entirely confused. We called in the benevolent troops and we released him from imprisonment. We got him back to his Source Light Energy, and made sure that all his aspects were with him, so that if he chose to release life on this plane, for good, he would be able to do that, not having to return into the reincarnational matrix energy harvesting trap. Immediately, within less than 24 hours, I was under full-on attack. There were several interdimensional beings within my field that were perturbed and didnt want him to be free. We released the contracts with my father and the Dark Lords, that had entered our family bloodline’s DNA 9 generations back. We found the Dark Lord and the Source of his entry and removed him from the Bloodline, at the point of entry, and cleared the curse that had been with our family ever since. The Dark Lords did NOT like this whatsoever. So, they proceeded to make my life a living hell. For the next 15 days. It took almost the entire trip to circumnavigate these energies and to bring them back into alignment and into right relations. The night we arrived at the house in the Sacred Valley, we had a Despacho Ceremony that took place with a local Peruvian Shaman. The ceremony was a Despacho Ceremony with Coca Leaves, honoring the Coca plant medicine and blessing our journey and time together. The ceremony was almost 5 hours long, and after a long hard journey, I was having a hard time staying fully present and being awake, not to mention that I was holding space for the clearing of all the densities within the house itself and the group that had come together. Many energies were leaving the space, and I felt a stirring up of old demonic energies with this ceremony, and so it was difficult for me to get on board fully with the process, as I felt it was somewhat compromised. The morning after I arrived at the house in Peru, I stood with BT, a beautiful Native American brother who we named “Rainbow Jesus”, and he proceeded to channel my father’s Spirit, and asked for my forgiveness, stating that my father had no idea what I had been through, that I had been raped and tortured as a child, among many things, and that now he could see from the other side, what I had gone through. Signing me up for those programs, he was on a need-to-know basis, he was following orders, but did not know or realize what was actually happening to me. I got incredibly triggered and began to just scream internally. This set off a rage in me that was just not manageable, I started to cry and said it would take some time for me to forgive him. I mean technically speaking, I already have forgiven him, but there was a deeper level that arose last winter when I had some deep memories that were suppressed reveal themselves and showed me that my father was actually getting paid for my torture. He, in fact, didnt actually know the depths to which they were untilizing me in these secret programs. He also had no idea I had been a part of the Secret Space Program. I had brought two tribe brothers with me on the trip, one was a romantic interest, and after this event of supporting my father’s soul, it proceeded to collapse and fall apart. There were many reasons for this, which would take forever to get into, other than to say, that one of the brothers was influencing the other brother, my romantic interest, and telling him things that were not true, and spreading what’s called the “Reptilian Spray”, a mind control tactic, throughout the group to try and turn everyone against me. This went on for days and days. We finally thought we had cleared this one brother, and it came back. It took almost the entire trip to release this energy from him, meanwhile everyone had to deal with deep levels of attack and energy that was not in alignment with our mission. What was crucial about all of this, is that there were two things going on here. One was, the dark forces were not happy that I had made it to Peru, even though they had tried everything to dismantle that reality, and two, they did not want me clearing and activating the Planetary Stargates in Peru. Whenever I have done this big work, there has always been a level of deliberate interference, as every time I have activated a stargate or cleared a vortex energy point on the planetary grid and restored it to its original divine blueprint, a little or a lot more energy enters the Earthly realms and allows access to more light, which then shifts the DNA of Humanity, and of all living beings, sentient or unsentient, simply put. This time however, they were not expecting the last piece, and neither was I. Firstly, I went to all the Ancient temples built by Extraterrestrial beings, and then followed by Incan Construction. Two very different realities. 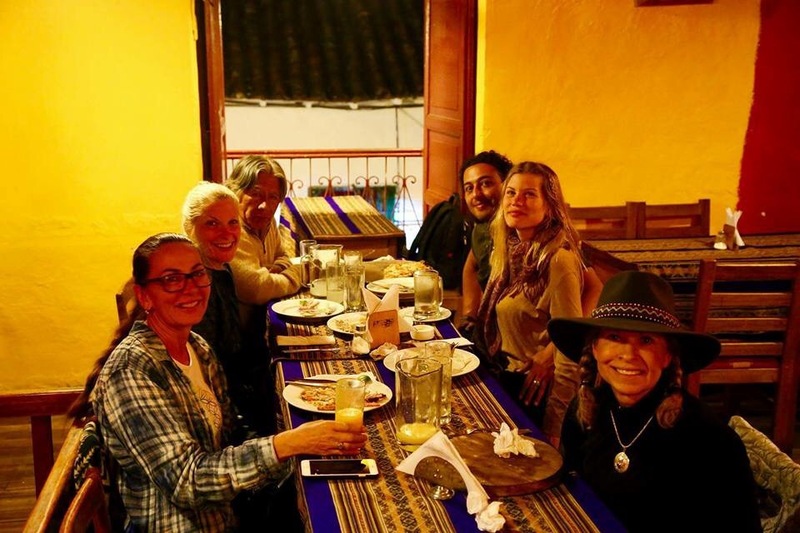 We travelled through the Sacred Valley, visiting all the most amazing temples and structures of learning, mystery schools, that were built long ago. This included Sacsayhuaman, Ollantaytambo, Pisaq Burial Grounds and the Sungate Temple, Wiracocha, Cusco, Machu Picchu, Waynapicchu, to name a few. Hiking in the blazing sun, and shivering in the middle of the Peruvian Summer at night, we traversed the Peruvian outback at 15,000 ft with grace, and sometimes lag, needing to wait for the brother that was in his own agenda and causing the group to wait. It put a strain on everyone. We were gracious, despite the hatred coming towards us. We chose to love him through it. Being the youngest of the group, he had this idea that he was in fact coming into his Christ nature, and proceeded to show signs of the Messianic Complex. He would not listen to anything anyone had to offer. So of course, this made things quite difficult, and many times, people considered leaving, as the group was not in sync and was desperately trying to find peace. Finally, one night, before the Lake Titicaca & Bolivian leg of the trip, he surrendered and let down his sword. Whew! I was then able to speak to our mission with the Stargates and what needed to happen. However, we had a listener/watcher within the house that night, that had been placed there to get inside information. The next morning, we ended up in the same position with our brother, and it started all over again. We did our best to just ride the wave. At that point, I just chose to be silent, no longer engaging, as he sat and proceeded to tell everyone that I needed to be eliminated. Fortunately for me, Rainbow Jesus came to my defense and everyone else, attempting to clear this energy, when he said, “You are welcome to leave Brother”. He immediately backpedalled and realized that the manipulation was no longer going to work. A sigh of relief came over the group, as he admitted that he was scared and would do anything to be a participating member of the group. At that point, he had alieneated most of the members of the group, and no one really wanted to interact with him, except the bromance that was going on with him and my collapsed romantic interest. Needless to say, I was exhausted from the intensity of the drama that had ensued and the level of attack that had been transpiring. I had also been dealing with my romantic interest going back and forth with his feelings, and being confused as to how he felt about me, and not able to decide what he wanted. Fortunately for me, there was a couple, Rainbow Jesus and his partner, who understood the deeper aspects of the Draconian energies and how they operate. So that literally saved me. We proceeded to hike Waynapicchu for 12 hours, in Machu Picchu. We hiked all the way to the top, and almost all the way down, stopping on the back side in the Moon Temple, where we performed ceremony and one of the members of the group and I independently proceeded to blast open the 5th Stargate that is in Machu Picchu. As I watched the Light streaming in a huge tube of light down into and spiralling up from the Earth, I knew I had completed my task. The beautiful thing is also that my father was with me, witnessing what I do, and who I truly am. On the way back up, my heart almost stopped 8 times. The Atrifibuxlation that exists within the family DNA revealed itself. I had to stop several times to make it back up the thousands of steep stairs. My romantic interest friend then held my hand for 2.5 hours, while we proceeded to climb those thousands of stairs back up the mountain. I wasnt sure if this was an attempt to take me out, or if it was just related to my genetics at 15,000 feet altitude! Haha! Everyone was gracious and waited for me, to make sure that I actually made it. I kept saying, “I am NOT dying on this Mountain!!! !” I obviously made it. That night, we had a harmonious dinner. It was lovely, with local musicians playing in the streets, in the small town built at the base of Machu Picchu. The next main event, was Lake Titicaca. We took a 7 hour drive to get to Puno, the town just at the edge of Lake Titicaca, on the Peruvian Side. We went through this really crazy vortex of a town about 30 minutes from Puno on the way there, and got lost and were almost unable to get out. The town, Juliaca, where the airport is, was the main town that people fly into to go to Lake Titicaca. The town was full of trash all over the streets, dogs and sheep eating the trash, as well as metal doors with little openings for a door, to a business, unfinished buildings, as if the town was either devastated by war, or had never actually been completely finished. You couldn’t look into the eyes of anyone on the streets, and I shielded our entire vehicle with an invisibility cloak and rainbow light to get us through. Puno, the city at the shores of Lake Titicaca, was inside the stargate and held a pristine energy in comparison to the previous city. We were grateful to finally arrive and sit down for a nice dinner. The following morning, we went to Amaru Muru, the “Gateway of the Gods”, where I received the download and instructions as to what to do exactly the next day in the middle of Lake Titicaca. I knew I had to be there on that particular day, March 10, so I made sure that we could show up on that day. What I didnt know exactly was what was about to transpire. We had decided to split into two groups of 4, and 4 of us stayed on the Peruvian Side, to go deep into the center of the Lake, the largest body of water in the western world, and the other 4 went to the Bolivian side, to the Island of the Sun, to the 7th Stargate, to receive the Energies through ceremony that I would be blasting from the center of Lake Titicaca. When I went inside Amaru Muru, I was met by an Ascended Master, St. Germain, an old friend from Mt. Shasta, whom I hadn’t seen in awhile. I was surprised to see him all the way in Peru, as it never occurred to me that he would leave his post there in Mt. Shasta. I just wasn’t really thinking about it, so when I saw him, I was overjoyed and moved to tears, like seeing an old dear friend that you haven’t seen in ages. It was a lovely reunion, but we quickly got down to business, as there was much to discuss. He reminded me of the information I had received in 2010, while living in Mt. Shasta, from the Quero Elders regarding the Cosmic Alignment of Planetary Bodies that was to occur. It had been 7 years, so I had completely stored this in the back of my mind, thinking that one day, it would come in handy. This was the day. I immediately recalled the story I had been told about the Cosmic Ocean of Light, lining up with the Great Central Sun of our Universe, lining up with our Galactic Sun, and then Solaris, our Solar System Sun, and then finally our Inner Earth Sun. Historically, this alignment has never taken place, so it was a special cosmic alignment that was designed to deposit energy upon Gaia, for the benefit of humanity and all the Earth’s inhabitants. He then told me the other piece of information, which I had not previously had, that put all the pieces together. He told me that 3 Universes were triangulating and receiving this energy. Our Universe was at the Apex of this triangle, and that the Cosmic Rays would come through the base of that triangle and go thru our Universal Apex and travel through to our Galactic Sun and onto the planet. The largest Body of Water in the Western World is Lake Titicaca, also the 7th Stargate, and also Mt. Shasta, the Largest Mountain in the western world. The energies would be depositing on this region of the world, and so therefore these were the places to receive these energies. It was requested of me that I go to the center of the Stargate in Lake Titicaca, on the Peruvian/Bolivian Border, in the center of the Lake, and open up the Cosmic Portal for 24 hours to receive the energies onto the planet. With instructions given and task in hand, I returned to the present moment, sitting in the cut out of the portal on the wall of the “Gateway of the Gods” and came to 3rd dimensional reality once again. I decided that it would be beneficial for me to cloak for the rest of the day, and to keep myself incognito until the Task at Hand had been completed. The next morning, cloaked and ready to go, we went to the Tourist Harbour in Puno, and got onto our pre-arranged boat, to begin the 2-day journey of doing ceremony in the center of the Lake and staying the night on one of the many islands in Lake Titicaca. This particular island, Amantani Island, held the two Temples, Pachatata, and Pachamama temples, honoring the Sacred Masculine and Feminine. This island has no wifi, and is strictly vegetarian. This was an exquisite experience to be on an island with a strictly vegetarian population. When we set off on our journey, in stealth mode, we boarded a small fishing boat, that was designed for tours. The boat driver, commented on the fact that in all his life, he had never seen the lake as such glass. The water was calm and clear, the sky opened up to the heavens and all was well. We set off on our 5 hour journey to the center of the Lake, stopping only for a homemade lunch on one of the many islands. On the way out into the Lake, I felt into the underground bases. I could feel the benevolent forces with us from an interstellar perspective, and the pristine energy of the Pleiadian base near the port of Puno, under the water. As we progressed further out, I could sense and feel the locations of the other two bases, not so benevolent, of Draconian and Zeta occupation. They appeared as black dense bases with much activity. We continued with BT handing each of us one of his majickal activated crystals that he personally mined himself. They were especially activated to deposit around the world, for world peace. We said our intentions and prayers and proceeded to grid them in 8 directions. This deposited the energies properly and cemented the work we were doing. Each crystal was holding the light frequency of the Cosmic Ocean. After finishing the ceremony, we sat, looking around at all the benevolent observers watching us within the clouds. There was even a rectangular window that was completely obvious. As guided, I left the portal open for 24 hours, until the following morning. We took a smooth ride to Amantani Island, that afternoon, and stayed with a Shaman and his family. We had a lovely home-cooked meal after a long-needed nap. It was a blissful moment in time. Nothing to do, except absorb these incredible Cosmic energies and receive the goodness of that moment. We smelled the flowers, gazed at the beautiful rich lucious purple corn, native to that island, and the gorgeous quinoa grown. All the crops were healthy and flourishing. It was a gorgeous sight to see. We sat, taking in the silence, and watching as the clouds moved in sync with our breath. The next morning, after a peaceful night’s rest, we got up, intending to go to the top of the island, to visit the Pachatata and Pachamama temples on horseback. When we all gathered, BT decided to stay behind. The three women proceeded to go up the mountain in a Hail Storm that arose out of nowhere. It was at that point obvious that we needed to close the portal as quickly as possible, as my sheild was growing weak and the 24 hours were approaching, so it would be easier for the malevolent energies to enter the portal. We got to the top of the mountain, to the Pachatata temple, and observed the entire 360 view of the all the islands on the Lake, it was a spectacular sight to behold. The three priestesses came together in a trinity formation and closed the Cosmic Portal, closing and sealing it with Rainbow light. Immediately the forceful storm energies subsided. It was amazing to witness. A peaceful stroll back down the mountain took us to the Shaman’s home once again, for a nice breakfast, before we headed out for Puno. Within an hour, we hiked back down the hill, to the port, and almost immediately there was a violent storm that ensued. It was clear that the malevolent forces were extremely pissed that they could not make their way into that Cosmic Portal. What would have normally taken us 2.5 hours, would now take 6 hours, with the storm that was brewing. Black waters and a boat that was tilting at least 60 degrees, and the smell of leaking gas from the boat motor, were our challenges of the moment. For awhile we just dealt with it, but after a certain point, I was done. I decided to command that the elemental forces calm down, and called upon benevolent Devic forces to adjust the situation, so we could make it back to the port of Puno safely. Within a few minutes, the waters began to settle, and we cruised back to the port. The boat driver, again, having grown up on Amantani Island, had never seen that level of a storm on Lake Titicaca. During the storm, the driver lost his long wooden pole used to dock the boat. As we approached the dock, I decided to jump and support the docking of the boat, next to the other boat, just at the dock. When I looked up, there was a cop, in riot gear, standing on the boat against the dock, waiting for us to dock the boat. I called out to BT to come and observe the situation. We nodded at each other with a knowing all too well of what we were witnessing. I decided to be the last one off the boat. The policeman made it so that we had to cross his path in order to get onto the dock. He was literally blocking our path. As I looked into his eyes, I noticed they were gold with black vertical slits. I put on my innocent face and waved, “HOLA!” Lol. He immediately jumped onto the boat, and began to search the boat. I later realized they were looking for technology. They were looking to see what could have created such a stir in the Antarctic realities. I began to chuckle to myself, thinking how odd and uncanny it was that the cops were there to greet us and look for any possible technology that could case this reaction. When we got to the tourist harbour, I noticed that all the stores were shut, and cops were everywhere, some in riot gear, some just in black uniforms. It was 12pm on a Saturday in the Main Tourist Harbour in Puno, the main city on the shores of Lake Titicaca. IT was just weird, all the way around. We all laughed in pseudoshock, once we realized what was happening. The rest of the day proceeded to be challenging as well. When we returned to the hotel, the doors were locked, there was no attendant, and no hotel residents. The hot water was off, and there was banging on the roof, for the entire day. That night there was a wedding with house music until 3am. Needless to say our plans of napping and showering and finally sleeping did not go well. The next morning we all laughed at breakfast at the irony of it all. We said, “IS that the BEST they can do? Seriously?” It was actually kinda funny. The Schumann Resonance of the Earth shot up from 11-13Hz to 113, to now over 200Hz. Peru had 811 cities that began to flood, causing an energetic culling effect. David Rockefeller died within 10 days of the Cosmic Deposit Portal. 3 Spiritual leaders received severe injuries, or were under attack. One of these people committed suicide. Since that point there have been many other levels of work that have been done in France and Greece, as well, including the 12th Stargate, that will be spoken to in a later post. For now it is important to know that things are getting handled, albeit, potentially in a haphazard fashion, but nonetheless, the final leg is upon us, closing this window at the end of 2017. The Stellar Activation Cycle closes at the end of this year, so it is high time to complete these tasks. If you are interested in doing any of this work, and are interested in what is coming next, please feel free to contact me personally via Facebook message (the best way at the moment), and I will respond and answer any questions you may have. Also, If you are interested in working with me on a personal level, and would like to know more about the Magi/Priestess Realignmetn Session Series, please feel free to contact me as well. I am also running a Summer Special on Akashic Readings, for $88 per session (value $111). A great gift is to invest in yourself with a series of these! For now, I send you off with the light of Spirit to fill your days. Omg! I completely forgot about that! Did I miss anything else? Please share! 🙏🏻💗💋🌈 Love you Rainbow Jesus!! Well from the get go; we had security guards / POLICIA chasing us around trying to prevent our ceremonies at each area from Huayna Picchu Mountain, Temple of the Moon at Huayna Picchu … remember they asked me to take off my Rainbow Ceremony Robe… 😉 … so many obstacles; Humanity deals with the darkness but FEARS the Light…. times are changing and we are a part of the shift! Love from Carla and I …..